USA Flags and Banners at College Flags and Banners Co. Fly your Favorite Team and Country Allegiance! 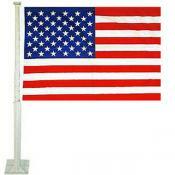 Find below our USA Flags and Banners which are In-Stock and Ready to Ship today. USA Flags include 4'x6', 3'x5' and 2'x3' Flags and specialty items including USA House Flags, Car Flags, Garden Flags, Pennants, and more.